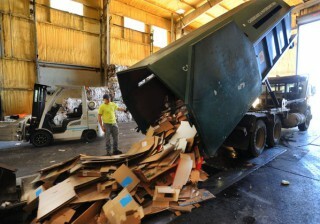 FAYETTEVILLE - The rate residents pay for recycling and trash service will get an update for the first time in 25 years. The City Council on Tuesday approved hiring MSW Consultants for $47,932 for a rate study for the Recycling and Trash Collection Division. The management consulting firm specializes in the waste and recycling industry and has offices in Florida, Pennsylvania and Missouri, according to its website. The current structure for residential trash service increases with a higher output, according to the city's website. A 32-gallon cart costs $9.68 per month. A 64-gallon cart costs $14.78 monthly. Ninety-six gallon carts cost $20.98 per month. Residences are allowed two free recycling bins. For apartments, recycling service rate is 97 cents per unit. However, trash fees are dependent upon whether the complex runs on an individual or master water meter. Chief Financial Officer Paul Becker said he'll serve as the point man between the consultants and various city departments as the study examining trash and recycling rates is developed. "To say it's dated is a disservice. It's long outdated," he said. The city adopted a recycling plan a year ago. Florida-based Kessler Consulting developed a 100-plus page report serving as a guide to divert 40 percent of waste from the landfill by 2027. The single-stream method of recycling, which was included in the original report, wasn't adopted as part of the plan after heated debate. Louise Mann, recycling advocate who has pushed against the single-stream method, requested more data from the city's recycling centers. She also pointed out apartment dwellers aren't held to the same financial standard as homeowners and called for development of an electric trough truck. "I suspect MSW was hired to tell us the only way to affordable recycling is single-stream," Mann said. Jeff Coles, recycling and trash collection director, reiterated single-stream wasn't made part of the plan and MSW has no relationship to the Kessler consultants. "Single-stream was never on the table with any conversation we had with MSW," he said. The council also unanimously adopted recommendations from a monthslong session of a pay plan committee looking at salary structures for the city's uniformed employees. Fayetteville-based Johanson Group concluded in a study last year police lagged the market pay rate by 15.6 percent and firefighters came up short 12.5 percent. Police and firefighters are on a step-based plan while other city employees are on a merit plan. Future studies will use Bentonville, Rogers and Springdale, along with Jonesboro and Lawrence, Kan., as the sample market. Previous studies used about 20 cities out of surrounding states and Arkansas. Also, the study will be done every year, but alternating between the uniform and merit-based employees. So this year the study will focus on pay rates for police and fire, in 2019 it will focus on regular city employees, and so forth. Additionally, benefit packages from the sample market cities, such as retirement, medical and dental, time off, certification pay and longevity pay, will be considered. The administration uses percentage growth in sales tax revenue as a guiding principle when doling out raises every year. Last year $1.7 million went toward raises. Police officers and firefighters got an average 6 percent raise. Merit employees received a 4 percent pay hike. The raises represented 100 percent of the amount Johanson recommended to get merit employees up to market but only 25 percent for uniformed employees. In other business, the council gave planning staff the green light to update the city's 2030 plan. As part of the resolution, the council added Archibald Yell Boulevard and South School Avenue from Martin Luther King Boulevard to Cato Springs Road to an upcoming College Avenue corridor plan. Bids are out to hire a consultant to look at ways to guide development along the corridor. Development Services Director Garner Stoll said the change likely will extend the process about three weeks and require additional money subject to council approval. The council also reappointed Chris White to serve a five-year term on the Housing Authority Board. Council Member Sarah Marsh cast the lone dissenting vote.